For the actor Tom Everett, see Tom Everett. 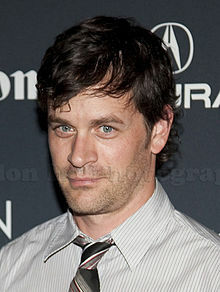 Thomas Everett Scott (born September 7, 1970) is an American actor. His film work includes a starring role as drummer Guy Patterson in the film That Thing You Do!, the protagonist in An American Werewolf in Paris, and notable roles in Boiler Room, One True Thing, Dead Man on Campus, The Love Letter, Because I Said So, and La La Land. In television, he is well known for his role as detective Russell Clarke in the television series Southland, Charles Garnett in Z Nation, and for his recurring roles as Eric Wyczenski in ER, Sam Landon in Beauty & the Beast, Kevin Duval in Scream, and William in Reign. He currently stars in the truTV sitcom I'm Sorry. Scott has had several other notable roles; he was the lead in the films An American Werewolf in Paris and Dead Man on Campus, and co-starred with Kate Capshaw and Tom Selleck in The Love Letter. He starred in the cult film Boiler Room and made an uncredited cameo in Van Wilder. While Scott did not realize his initial success and become a leading man, he has had recurring roles on the television series ER in 2002 and 2003 and has played numerous minor parts in other films and television shows such as Will & Grace and Sons of Anarchy. He co starred in the series Philly as a lawyer, partnering with Kim Delaney. The show was a critical success but suffered poor ratings and was cancelled after one season. He also starred in Saved, a medical drama series on TNT. He starred in the TV movie Surrender Dorothy. He appeared as one of Mandy Moore's character's boyfriends in the comedy Because I Said So, and starred in a Broadway theatre comedy, The Little Dog Laughed, as closeted film star Mitchell Green, written by Douglas Carter Beane. He also appeared as Zip in an Off Broadway production of The Country Club, also written by Beane. He starred as Jack Cutting on the ABC's brief comedy drama series Cashmere Mafia (2008). In 2009, he appeared in four episodes of Law & Order playing the fictional Governor of New York, Don Shalvoy. He also played Detective Russell Clarke in the seven episodes of the first season of Southland, which was dropped by NBC and subsequently picked up by TNT. At the start of second season, he became a recurring character appearing in three of six episodes. In the third and fifth season of the series, he continued to appear in selected episodes. ^ "Celebrity Talk ..Checking In With Thomas Everett Scott". The Free Lance-Star. November 10, 2002. Retrieved September 6, 2012. ^ "William Joseph Scott's Obituary on The Enterprise". The Enterprise. ^ "ProQuest Archiver: Titles". pqasb.pqarchiver.com. ^ "Blanchard Funeral Chapel - William "Bill" J. Scott - Obituary". currentobituary.com. ^ Lynn, Allison (October 21, 1996). "The King of Thing". People. ^ "That Thing He Does!". Surface.syr.edu. Retrieved 2017-06-25. ^ "Movie Review: Because I Said So". www.cbn.com. ^ Petski, Denise (14 September 2016). "Andrea Savage Comedy Pilot Picked Up To Series By TruTV". ^ Gonzalez, Sandra (February 4, 2014). "'Beauty and the Beast' Casts Tom Everett Scott for Intense Recurring Role". Entertainment Weekly. Retrieved June 5, 2017.